When the yogi regularly practices in this way, in a short time his heart becomes fixed and free from disturbance, like a fire without flames or smoke. If one can understand Krishna as the supreme enjoyer, the supreme proprietor of everything, and the supreme friend of everyone, one is established in peace and is free from material agitation. However, for one who cannot understand the Supreme Personality of Godhead, the practice of yoga is recommended. Prahladananda Swami gave the morning class today. He begins by quizzing us on the previous verse and then continues with the first verse from the 7th canto 6th chapter. This is the start of Prahlad’s teaching to his fellow students. The class ended prior to the end of the purport. I don’t know if we’ll have a followup class, but if we do I’ll get it posted. Prahlada Maharaja said: One who is sufficiently intelligent should use the human form of body from the very beginning of life — in other words, from the tender age of childhood — to practice the activities of devotional service, giving up all other engagements. The human body is most rarely achieved, and although temporary like other bodies, it is meaningful because in human life one can perform devotional service. Even a slight amount of sincere devotional service can give one complete perfection. One need only chant the Hare Krishna maha-mantra. Everyone engaged in the practice of chanting the Hare Krishna maha-mantra will be completely cleansed, from the core of his heart, and be saved from the cycle of birth and death. Prahladananda Swami continued lecturing on the last verse of this chapter. The begining of the class is an interesting lesson on how well we actually listen and remember the verse. We do get it memorized eventually. Continue reading below for the full verse and purport. te — they; tu — indeed; tat-gauravat — from great respect for the words of Prahlada Maharaja (due to his being a devotee); sarve — all of them; tyakta — having given up; krida-paricchadah — toys for playing; balah — the boys; adushita-dhiyah — whose intelligence was not as polluted (as that of their fathers); dvandva — in duality; arama — of those taking pleasure (the instructors, namely Shanda and Amarka); irita — by the instructions; ihitaih — and actions; paryupasata — sat down around; raja-indra — O King Yudhishthira; tat — unto him; nyasta — having given up; hridaya-ikshanah — their hearts and eyes; tan — unto them; aha — spoke; karunah — very merciful; maitrah — a real friend; maha-bhagavatah — a most exalted devotee; asurah — Prahlada Maharaja, although born of an asura father. My dear King Yudhishthira, all the children were very much affectionate and respectful to Prahlada Maharaja, and because of their tender age they were not so polluted by the instructions and actions of their teachers, who were attached to condemned duality and bodily comfort. Thus the boys surrounded Prahlada Maharaja, giving up their playthings, and sat down to hear him. Their hearts and eyes being fixed upon him, they looked at him with great earnestness. Prahlada Maharaja, although born in a demon family, was an exalted devotee, and he desired their welfare. Thus he began instructing them about the futility of materialistic life. The words bala adushita-dhiyah indicate that the children, being of a tender age, were not as polluted by materialistic life as their fathers. Prahlada Maharaja, therefore, taking advantage of the innocence of his class friends, began teaching them about the importance of spiritual life and the insignificance of materialistic life. Although the teachers Shanda and Amarka were instructing all the boys in the materialistic life of religion, economic development and sense gratification, the boys were not much polluted. Therefore, with great attention they wanted to hear from Prahlada Maharaja about Krishna consciousness. In our Krishna consciousness movement, the guru-kula plays an extremely important part in our activities because right from childhood the boys at the guru-kula are instructed about Krishna consciousness. Thus they become steady within the cores of their hearts, and there is very little possibility that they will be conquered by the modes of material nature when they are older. 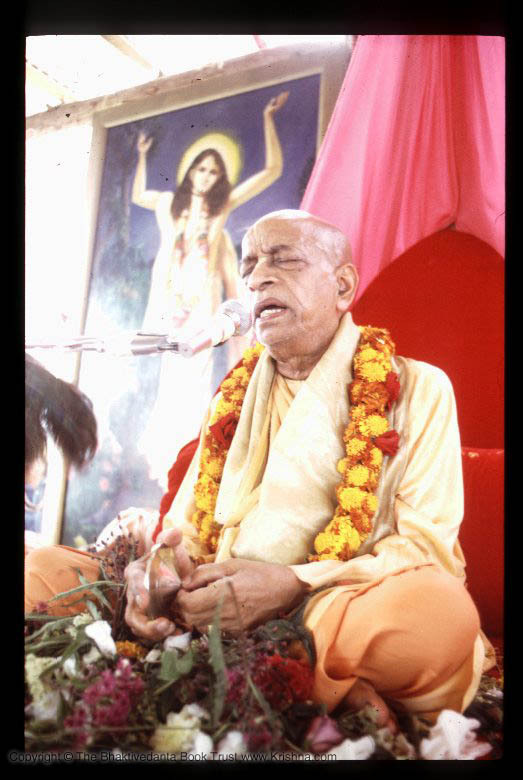 Prahladananda Swami – Lecture on Srimad Bhajagavatam 7.5.55. Prahlad Maharaj is preaching to the other students in his school. His Holiness Prahladananda Swami spoke this morning on Srila Prabhupada’s Disappearance day. Enjoy. Prahladananda Swami will be visiting all week. I’ll do my best to record as many classes as I can.